If you think these festive Red, White and Blue Glazed Shortbread Cookies look difficult, check out the video and you’ll be a believer! Happy Birthday USA! We’re thrilled to celebrate your 241st anniversary coming up on July 4th. But we hope you don’t mind – instead of birthday cake this year, we’re commemorating your big day with a stack of the prettiest, most festive, super patriotic cookies you’ll ever have the pleasure of meeting! In honor of you and our beloved flag, we’re calling them Red, White and Blue Glazed Shortbread Cookies. It’s funny, though we’re barely two weeks into the season, here in the U.S. we’re approaching “the peak” of summer. If you don’t live here, that might sound sort of strange, but to us, it makes perfect sense. Our big summer holiday is the week surrounding the 4th of July, when we celebrate the anniversary of our independence as a nation. As crazy as it sounds, after the fourth, the summer seems to subtly wind down, as school supply ads begin to sprout up and sales on summer clothing and outdoor “stuff” are here, there and everywhere. Parties, picnics and festive get- togethers are planned and anticipated all year long for this first week of July. The highways and byways of the nation are crammed, as many leave everyday life behind and head to the lake, beach or mountains for a getaway. It’s a time to swim, fish, sun, boat, bike, hike, explore, read and simply chill out. Our celebration includes parades, patriotic songs, fireworks and, of course, lots of good food. I wanted to give you a spectacular recipe that would bring lots of rave reviews, but also one that would be fairly easy to make at this busy time of year. 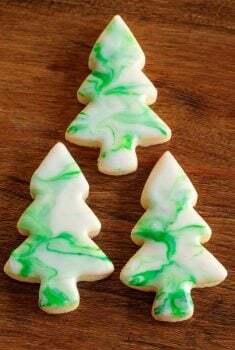 As I thought through it and tossed around ideas, I remember the Glazed Cutout Shortbread Cookies I posted earlier this year. “Perfect”, I thought and started experimenting with a patriotic version. Instead of using a mixer as I did with the Glazed Cutout Shortbread Cookies, I decided to try these cookies as a one-bowl-no-mixer recipe and it worked out well. Just make sure your butter is nice and soft and you’ll be good to go. The dough comes together in just a few minutes! 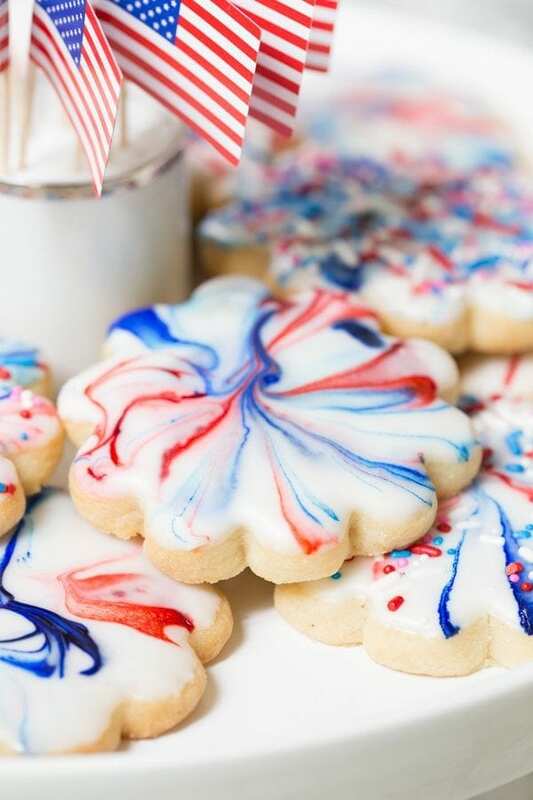 Oh, and the decorating technique for these Red, White and Blue Glazed Shortbread Cookies? I know it looks a bit fancy and time consuming, but that’s not true on either count. I figured you might think I was spoofing, so Scott and I made a video of both the cookies and the icing technique, so you could see for yourself! See what I mean? Easy peasy! And a perfect activity to do with children of all ages. Each cookie turns out totally unique, so everyone will be thrilled with their own personal creations. Not American? Not a problem! 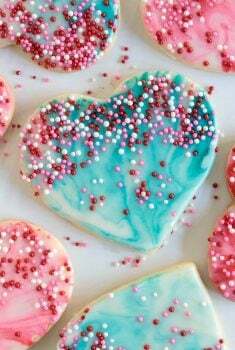 You can make these fun cookies too and make them the colors of your flag. Or your school colors. Or your best friend’s favorite colors. Or whatever colors you fancy! Pinched for time? 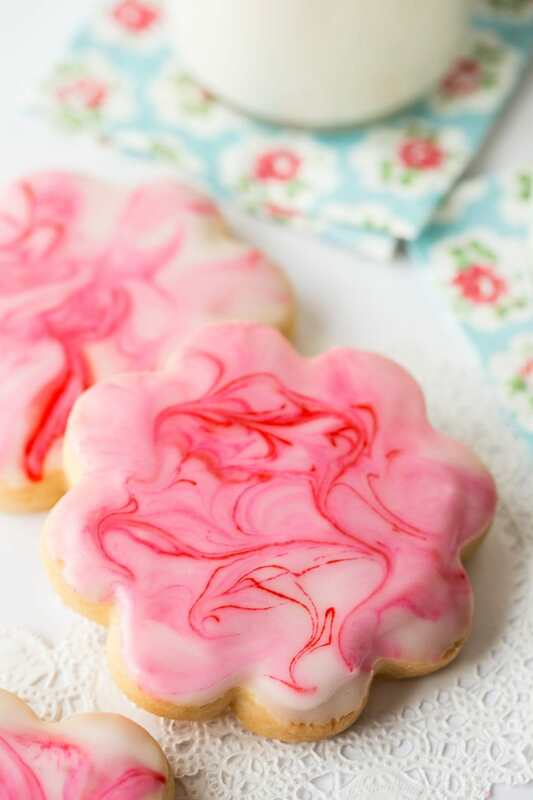 Although these shortbread cookies come together fairly quickly and are melt-in-your-mouth delicious, you could also use this decorating technique on plain store-bought sugar cookies. No one has to know you cheated just a bit! Ready to celebrate? 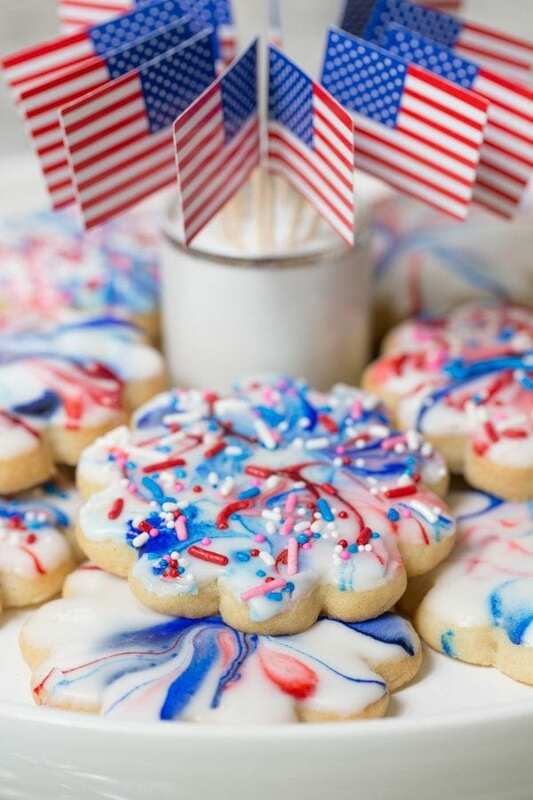 Make the occasion beautiful with these Red, White and Blue Glazed Shortbread Cookies and wait for the ooohs and aaahs! Make sure the butter is nice and soft. Otherwise it will be difficult to mix the dough without a mixer. I usually set the butter out the night before. Dough needs to be chilled for 15 minutes before rolling. If you chill it longer, it’s fine, but you’ll need to let it warm up a bit as it will be too firm for rolling. Allow Red, White and Blue Glazed Shortbread Cookies to dry on a wire rack for an hour after glazing, then store in an airtight container. Cookies can also be frozen. Thaw on a sheet pan for an hour or two before serving. 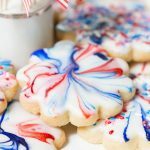 If you think these fun, festive Red, White and Blue Glazed Shortbread Cookies look difficult to make, think again! They’re not only super easy, the decorating technique is also a breeze! 1. For the cookies, preheat oven to 350˚. Line two baking sheets with silpats or parchment paper. 2. Beat softened butter with a whisk until soft and fluffy. Add powdered sugar and vanilla and mix until smooth and creamy. 3. Add flour and salt. Mix with a sturdy spatula or large whisk, just until all flour is incorporated. Make sure there’s not dry flour at the bottom of the bowl. 4. Place dough onto a piece of plastic wrap and form into a disk. Wrap well and chill in refrigerator for 15 minutes. 5. Remove dough and unwrap. On a lightly floured surface roll out the dough about 3/8- inch thick (see notes above and video). 6. 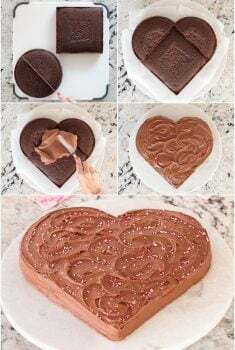 Cut into shapes using a lightly floured cookie cutter. Gather scraps into a ball, preroll and cut more cookies. Place cookies on the prepared baking sheets and place in the refrigerator for about 15 minutes. (This will firm up the dough so the cookies will maintain their shape better when baked.) Bake for 15-18 minutes, or until cookies are lightly browned at the edges. Cool on a wire rack. 7. For the glaze, combine powdered sugar, vanilla, lemon or almond extract and 3 tablespoons of the milk in a medium large bowl. Mix well and add more milk, one teaspoon at a time until a thick but drizzle-able glaze is formed. Transfer half of the glaze to a small bowl. 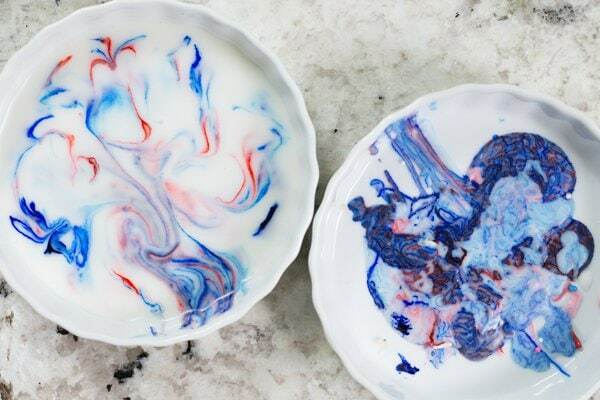 With a toothpick, add a small amount of red and blue gel food coloring and swirl it just a bit. Don’t swirl too much or the icing will become murky. Use a light hand with the gel food coloring. A little goes a long way! 9. Add more of the white glaze to the bowl when needed. Repeat adding more gel coloring as needed. 10. For storing, see Café Tips above. Hi! These cookies are beautiful I wanted to ask if you use salted or unsalted butter in this recipe? These are a great way to end summer along with the other great recipes you shared. It’s been a delicious summer at the Cafe and I’m looking forward to lots of fall inspiration! I can’t believe it’s July 8 already! I am definitely pinning these for future reference, Chris! So adorable and festive! Aren’t these cookies festive. They remind me of Spin Art with all the swirls – how fun! the cafe’! I love how you’ve customized the concept for different occasions! 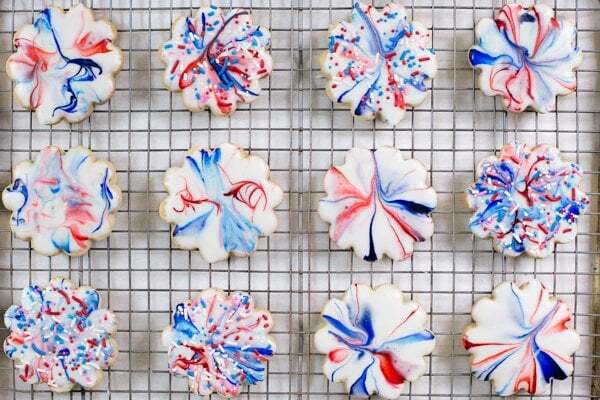 These are the prettiest patriotic cookies I’ve seen. The video is wonderful, what a helpful tool! Happy 4th to you!! What beautiful cookies, perfect for your celebration! Oh Chris, your cookies are so red white and blue pretty!! I just LOVE the abstract glaze! I just made the ugliest red white and blue monkey bread concoction, it looks like a hot mess but it tastes good so you might see it referred to as the exploding firecracker cake in the future! Happy 4th! 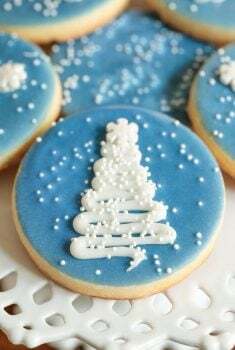 These are just perfect, festive cookies and I love the video that shows just how easy they are to make! Happy July 4th Chris! They are so pretty and festive! Thank you so much for all your wonderful recipes. 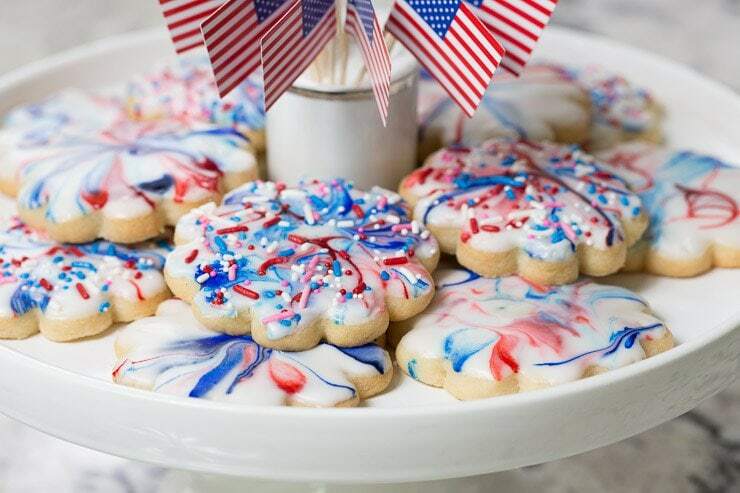 I have to have these cookies for the 4th of July. stories. Ps. Will make them for all special occasions! Beautiful! They look just like bite-sized fireworks! I was awed by the single color swirls you did earlier this year and am even more impressed with these multi-colored patriotic swirls! gluten intolerant….could I sub another flour and have same results?? thanks!!! Happy 4th! How cute:) Thank you! They are gorgeous! And I would never have thought of dipping them! Perfect! How long does this frosting take to set up? Will I be able to stack them? You can definitely stack them once they’re dry but I would let them sit on a wire cooling rack for at least 2 hours before stacking. How fun!!!! I want to make these 🙂 I bet they are tasty too. Have a wonderful July 4th weekend Chris! You beat me to it Chris! These look delicious. I’m hoping to make some with the neighborhood kids at the beach over the holiday weekend! Love shortbread! Yours are gorgeous! I’m will make these cookies with my eight year old granddaughter this week when she visits, but have question about dowel size, 3/8 inch or 1/4 inch as mentioned in recipe. Is 3/8inch just your preference? For these cookies, a 3/8-inch dowel is actually better. You want a little thicker cookies so you can keep a grasp on it while dipping the cookies in the glaze. I will change that in the recipe, thanks!